“You stick what where?” Yep I do. My blog is names “gutsy” for a reason. I am not afraid to do what it takes to heal my body no matter what, no excuses. If you are ready to take full control of your health, then this is the post you have been waiting for! I was doing the GAPS diet on my own. You should have seem my family’s faces when I cam home with a bag of bones or when I started eating beef tallow. Complete shock. Lets just say they have all come along way and actually have joined me in my strange ways. How was I ever going to get away with doing an enema if they cant even handle bone broth? I set my fears aside and just went ahead, bought the enema bag, and boiled the coffee. The worst that happened was I could not hold it more then 1 second (actually I could barley get 1/4 of the bag of water in me). I had stomach cramps and was nauseous for a few minutes (Im sure from 18 years of old junk stuck in that space), but it was over after I expelled the water. This does not happen to me anymore now that my colon is fairly clean. First lets address if you can use a little liver detox- shall we? The liver preforms 500+ functions known in the body! makes the body more yang: Dr Wilson explains that your body become yin when you are sick and plagued with toxins. Your should strive to make your body more yang with cooked veggies, saunas, and coffee enemas. Make sure bucket is 18 inches or less above the body- if it is too high the coffee will flow too fast. Cant get the nozzle in! : The most simple way to overcome this is lubrication. Use coconut oil or olive oil to help slide the nozzle in. Also make sure you are not too tense- this can contact the muscles in that area. You don’t have to put the nozzle in all the way- just enough that the liquid goes inside of you and not on the floor. You will not hurt yourself if you put the whole nozzle in though (adult body). Wow, Caroline. Another great post. I’ve never done an enema and it sounds terrifying but you answered all the questions I was too scared/embarrassed to ask! Maria, that was my intention- I went back to my nervous pre enema brain and wrote down all the questions i wanted to know but could not find. Now i know 🙂 they have served my liver well!! Your post is completely perfect timing (God’s timing is always perfect)! I have been on GAPS for 8 months and I’ve been doing coffee enemas daily for 4 months. I am 28 and I have Hashimotos disease, yeast/bacterial infection for going on 2 years, food allergies and adrenal fatigue. I feel much benefit physically from the coffee enemas, but I was just about to quit because I cannot tolerate the caffeine. Many symptoms are relieved but they are replaced by headaches and irritability. I love to research but I’ve never seen anything about the phase 1 liver detox pathway before! This explains so much! It makes sense that my hypersensitivity to caffeine is a sign of toxicity. Thank you so much for providing this information! It’s really difficult being a mom to a 5 year old and a 3 year old and being so sick. I’ve just started following your blog and I am so encouraged; I especially love how you always point back to God’s faithfulness. He has been the one to get me through every day. Terrible advice. This is NOT something that can be done safely for everyone. You can joke about how you were scared about ripping your colon, for example, but that CAN happen to some people. I have had surgery on mine, and mine is weaker than most people’s. Yes I did not mean it in that way- and i do put precautions on the blog because I DO know people are out there who have had surgery and cannot do them properly or at all. Im sorry if I offended you or scared you- of course think, but i was referring to if you are scared about the gross factor. thank you for clarifying. You were quite clear on your post. Some people want to make it all about them! Thanks for a fabulous comprehensive post. I’m a naturopath and love this technique – the science makes sense and of course it does heal, and like everything in life just exercise common sense too! Thanks for a fabulous comprehensive post. And unlike an earlier ‘moody’ poster that wanted to make it about them I thank you! I love the technique, I’ve been doing them on/off for several years (very on at mo as I’m trying to heal my body) – the science makes sense and of course it does of course heal (as long as one exercises common sense)! I have one question: what would you say the difference was between coffee enemas and a strong liver cleanse that gets rid of stones – I did a bowel cleanse and then liver cleanse with Epsom salts etc a few years ago at a retreat in the UK. It was quite horrible but I did get rid of stones (not sure I felt better ) just wondering what the difference between CE & this would be? I’m inspired to read more of your blogs. What have you read about coffee enemas and breastfeeding? Would toxins go out of the body through the milk at all?? You say to listen to the gallbladder sound, but what if a person doesn’t have their gallbladder anymore? Also, in your research have you read if there could be a benefit of doing enemas for someone with kidney failure? I realize that any severe/chronic illness a person should speak to their Doctor before trying something like this, but just curious if you’ve heard anything. Unfortunatly most of the general medical community is not up on natural healing or detoxing of any kind. However it makes sense to me that if a persons kidneys are no longer filtering waste/toxins that doing enemas might help. So for kidney failure- i found that it can be beneficial to help lessen the toxic burden off your kidneys, but some sources say that it is not to be used by people with kidney disease. Can you ask a naturopathic dr. maybe? The gallbladder is important but the liver takes over the bile production when it is removed. Bile production itself is increased by as much as 25% – 30% so instead of it increasing bile from the gallbladder it will stimulate it from the liver. The liver drips bile slower the the gallbladder which is why people without one had a harder time digesting food. You probably wont have that squirt and will just have to monitor your symptoms with the caffeine. Detoxification enzyme activity remains elevated for hours after the coffee enema! Great article! I have a question about steam coffee makers – youknow the kind that makes a full pot of coffee in like 3 minutes. Is that ok? I just know myself – boiling a pot on the stove for 15 minutes and then having to drain out the grinds with a strainer or cloth is going to discourage me from more frequent use. Thanks so much. GREAT ADVICE! (Unlike the rude Miss. Carly who threw your entire article out with the enema water) ABSOLUTELY GREAT! I’ve been trudging through adrenal fatigue (among several other things) for three years now… slowly getting stronger and better, but some weeks still feel like I get knocked down. Coffee enemas have been an inconsistent part of my journey. For the first time I performed an enema this morning and literally expelled NOTHING! It’s been six hours now and still, nothing! Should I be alarmed? What is going on?? Ellie if your colon is filled with toxic material then your colon is not getting hydrated properly. I would do a few enemas to first flush out the build up in the colon wall. Hello Gusty, I did a coffee enema last night and today I feel horrible. I have a terrible headache and I’m very nauseous. What did I do wrong? You are detoxing. THe CE stirred up toxins in the colon. I think you need to do another enema or maybe even 2 to flush out all the toxins. With this post open on my computer and clutched close to my chest, I was able to get up the nerve to try a coffee enema for the first time today. Thank you so much for this super clear and detailed post, Caroline. I don’t think I could have done it otherwise! I forgot to mention that they advised to have binder before taking coffee enema because it helps prevent the toxin from being absorbed back to your body. So do you still get all the benefits the coffee enema would give without taking binder? I just don’t want to put into my body unnecessary supplement. I dont use a binder, I think the CE does a good job expelling the toxins. If one has been doing the enemas for a long time how can they restore their peristaltic health? I have suffered from constipation my whole life and would love to stop their regular use. I use them for detox but they help with elimination so I am getting the double benefit but do not see it as a lifestyle. Thank you. Your constipation could have a deeper reason and I would get that checked by a natural/holistic dr. or TCM practitioner. The coffee enemas help detox the liver, but your gut could be lacking good bacteria it needs create a smooth digestive system. Have u done wheat grass enemas? Also, does the sawilson coffee stain? Thirdly, gerson now recommends cafemam coffee, not sawilson. Any thoughts on this coffee? I use an organic light roast from whole foods (allegro)… Is this ok, or can this cause issues bc of possible mycotoxins and carcinogens from the roasting? Lastly, what is your opinion of the seeking health bucket vs the purelife bucket? Hi, wow that’s great to hear your results with the coffee enemas! I recently discovered them as well. I first heard about them in the book Clean Green and Lean I think it was called. The amazing light energized happy feeling afterward is amazing. It downright borders on euphoria. And it’s definitely not just the caffeine, I never feel anywhere close to this good from drinking coffee. I’m guessing I have a fair toxic load and it’s going to take a while to get rid of. I used to play with bad things like Raid ant spray as a kid, I have probably several cans of that stored in my body. I can literally smell it sometimes in the sauna. oh no! thats scary to play with. Yes I bet you will have “layers of healing”. I do, and it is a roller coaster. How long does it generally take for the enema bag to empty? I put 2 cups in. Hi there, a good post. I was looking into the possibily of feeling restless after an enema and this site came. And yeah, It happened when the coffee enema did not come out. Now I know, that I have to make sure it comes out. Yes that is a good thing to make sure or else the caffeine will make you restless. Do a water one after. Great article! I’ve been reading up so much on the topic. I’ve been juicing for a week and doing the CEs daily for 2 weeks. Sometimes I feel great afterwards. Sometimes I have a lot of cramping. Tonight was the first time I’ve seen bloody mucus and I have more cramping. Medical history is Hashimotos and celiac disease. Does bloody mucus happen from time to time, or should I cease the CEs because they may be causing the problem? Thanks for the great post Caroline! I’ve been wanting to try CEs for ages. I don’t want to waste any coffee so I’ve decided to do a few water enemas first to get used to them. The first time I did it I was on the toilet for 30 mins after with diarrhoea and had a little diarrhoea later in the day. Now I’m a bit reticent to try another enema. Do you know whether this is a normal first time experience? Emily, yes that is completely normal. You may have cramping, nausea, loose stools for even up to a week as the “heavy load” of toxins come out. Usually it only lasts the first or second enema though. I sometimes do a water one before the coffee so I can hold it longer. I was doing this (coffee enemas) without instructions, just winging it, so to speak, and one night before bed fixed a pot of coffee, let it sit for awhile, then went to fill the enema bag. I noticed the coffee was still warm but was pretty tired and didn’t notice that it was still actually hot, and didn’t check the temp before putting it in. It turns out the pot was still on and the coffee was scalding hot and I put it in my colon anyway without noticing it. So it burned pretty bad, as the colon, of course, doesn’t have the kind of nerves that “tell” you this immediately. It insisted I expell it immediately which I did–at least part of it. Some of it stayed in long enough to scald and burn the colon, which I didn’t notice for many minutes. it’s a day and a half later and I’ve tried to sooth it with Aloe Vera juice and water, but it still hurts. Am I gonna die? Etc. Please respond, I’m really worried about this. Hi George, oww! Sorry about this experience. I think you learned a lesson the HARD way. I dont think you will die but you may want to contact a natural medicine dr to see if you need to be checked. I would try an aloe vera enema to sooth it. I would stress extreme caution before doing anything other than the occasional water enema. I am a critical care nurse at a large research hospital, and we unfortunately see a number of patients with liver injury and bowel dysfunction. Many of them have tried enemas (including coffee enemas) and end up in our emergency dept (later admitted to my medical ICU) for severe hypokalemia & elevated LFTs (complete with mental status change). These imbalances can lead to cardiac abnormalities as well as other GI dysfunction. 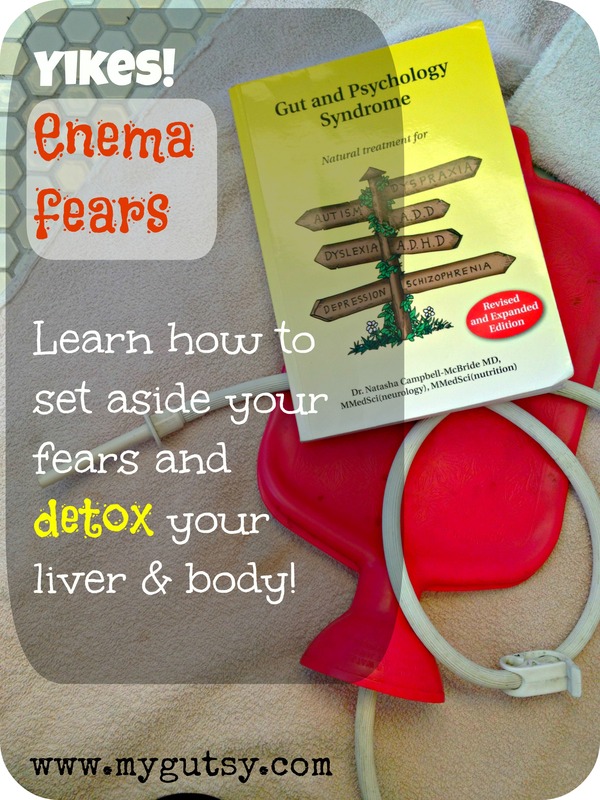 Arguably, many people do enemas regularly without any acute incident, however the liver and bowels are only good at healing themselves quickly for so long. Most of our more serious cases are older patients with a long history of years of repeat injury they weren’t even aware of. So I believe it’s best to check first with your primary care physician or gastroenterology MD to make sure you are using the right enema solution and at an appropriate frequency, as well as to make sure enemas are even indicated for your situation. Hi CCRN, I too believe to ask a naturopath of holistic practitioner if you have complications you are worried about it. I also wrote a whole section about being SMART while doing them. Thank you for you concerns. Holly, the enema will still benefit your liver and it probably could use it even more. The liver drips bile (without a gallbladder) into the small intestines in your case. The coffee enema would still be beneficial because it helps increase the number of detoxing enzymes in the liver. This way you will still help your body release stored toxins. Due to excessive liver toxicity as well as severe candida infection i found it is necessary to wait a few minutes 15 or so and follow up with a water enema with a tablespoon of salt for electrolyte balance. The coffee enema drew so much toxins it gave me nausea. ( extreme toxins in the intestines and up to the stomach) the additional flush drains all the sick feelings and i can even feel the purging of the liver, gallbladder and even the lymphatic system. Have you ever tried an 8 ounce coffee enema? 2 to 3 tablespoons of organic dark roast coffee to 8 ounces of water. Use a bulb syringe or 2 empty fleet enema bottles. Retain it for a minimum of 30 minutes or let it absorb into your body. You will feel the detoxing working. I use dark roast because I researched it and found that it is more yang (good) for you and light roast is more yin (bad) for you. Are you also into the added benefits of doing colonics along with doing the coffee enemas. I ask that question because you will clean out most of the toxins in the upper part of the colon, so the coffee enema can do a better job detoxing the liver. The toxins in the upper part of the colon will be reabsorbed into the body and you are back to square one. We all live in a toxic world. Get rid of the toxins and most if not all diseases will not exist. God bless you Caroline on what you do to help others help themselves. I am happy to see that it helped you get over your medical issues. HARD TO RETAIN AN ENEMA? Try these tips they worked for me. 1) FOR COFFEE OR HERBAL ENEMAS : I use 8 ounces of a coffee or herbal concentrate (make it to the strength you want it to be) and an 8 ounce bulb syringe. 2) FOR ENEMAS THAT USE AN ENEMA BAG OR BUCKET: I use a roller clamp (not the snap or ratchet type that comes with most kits) and a douche nozzle (just as good as a retention nozzle and much cheaper). Both the roller clamp and the douche nozzle reduces flow rate and water pressure that causes cramping. The flared tip of the douche nozzle also helps from slipping out. CAUTION : LADIES DO NOT USE THE DOUCHE NOZZLE FOR VAGINAL USE IF YOU ARE USING IT FOR ENEMAS. YOU CAN STILL GET AN INFECTION FROM IT EVEN IF YOU CLEAN IT GOOD. I’ve been doing c enima now for 2 weeks. Do you know if the Wilson’s coffee is tested for mold/mytotoxins? I would like to use it as it is much cheaper than the purelife enema coffee I am currently using, but am hesitant as it doesn’t mention anything about mold which a huge concern for me with CE’s. Do you stop enema’s when you are on your period? Annemarie, a woman who works in my local health food store told me that getting a warm water enema when laying in a tub full of warm water helped her. I tried it. Felt great! Not a doctor or medical person here…but, I have read and been told you can get a enema when on period. Was hoping Caroline would comment on your question and Lisa’s as well. Very good blog! Well covered and written. Actually one of the best pages about CE I have read. Glad you included enemas for children. 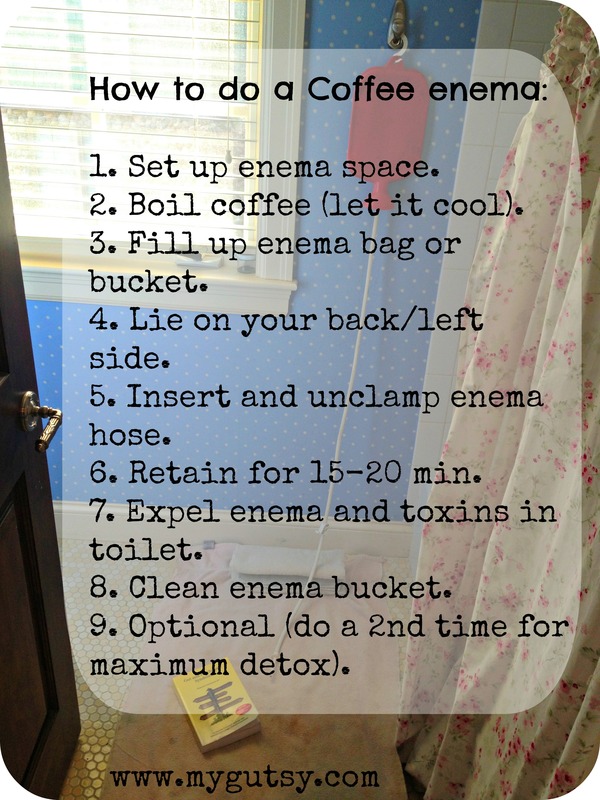 Enemas are a wonderful natural home remedy. They are given often in my home. I find the best position for the toddler to receive the enema is across the lap. On a towel. Face down laying on tummy. Good idea to have something for him to watch or do when receiving the enema. This helps him to relax. Makes administering the enema much easier. Always check with your naturopathic doctor, doctor or pedi before giving a home enema. I’ve been doing coffee enemas for around 8 years and am doing them daily at the moment for health issues (not just Candida). I’ve found that I’ve been expelling lots of what I believe to be Candida after the enemas but also in general. Why exactly is this? Do coffee enemas have such a powerful effect on killing pathogens/Candida? And if so why is this more so than anything else I’ve tried such as powerful anrifungals and colonics? Second question: do coffee enemas work better at detoxing the liver than a so called liver cleanse (using Epsom salts and grapefruit etc for instance)? I did a cleansing retreat for a week a couple of years ago and it was to cleanse bowel and liver. With the liver cleanse we all discharged lots of liver stones although the process leading up to it was certainly not pleasant. Which technique would you say is better for cleansing the liver and why? Is it ok to use 40 or more ounces of water instead of 32? Sometimes I don’t feel I get a complete release with just 32 oz. Thanks. Hi, Caroline. 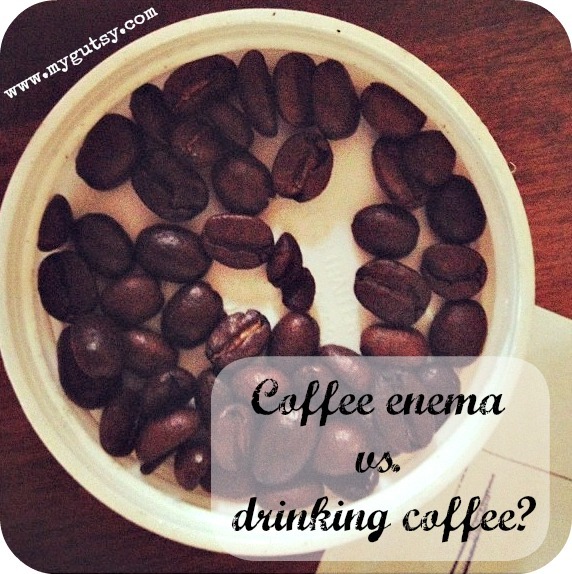 Being new to coffee enemas, I found this article extremely informative and interesting. I really don’t have any symptoms, but started these enemas as an adjunct to infrared sauna sessions. The only health problems I have are hypertension and insomnia. Hopefully, these problems will resolve with doing the enemas. Also, I don’t know if you’re concerned with spelling, but there are a lot of typos…I’m willing to help you find them if you like. Thanks for the article….the best one I’ve found yet. Lisa, hope your questions get answered soon. I also have wondered the same. MaryAnn, tuypos?? haven’t seen any myself. (joking). Isn’t this a wonderful page? So much information given. Well done. I have been interested in that. As far as the coffee enemas…. I don’t know if a series of Cus will help with hypertension and insomnia. They may. Please let us know if you feel the Cus helped your hypertension and insomnia. I would love to know if the enema helped or not. Do you get a enema before or after you do the sauna? I love getting a coffee enema and regular enemas. Feel so good after a enema. Have you heard of baking soda in the enema? I have candida and leaky gut and I’ve read that baking soda in the enema can help a lot, but I’m not sure if it can be combined with coffee. I just did one today anyway and nothing bad happened. I figured it would be good against the acidity of the coffee too since the colon flora want an alkaline environment to thrive and acaidy promotes bad flora. I’ve suffered 25+ yrs (35) with countless issues so I wonder how many enemas I will need to do… I of course do much more already but nothing has worked. Thanks for the article. Caroline, hope you are ok and still read the comments on here. Havent read any from you in awhile. My wife had her gallbladder removed and ever since she’s gained weight and now coincidentally for the past few months she’s been having liver pain. She’s had many tests and the doctors cannot figure out why her liver enzyme level fluctuates from 100 to 140, once it went up to 900 when I had her hospitalized. The doctors now want to schedule her for a liver biopsy and were both extremely worried about that because of complications! We’re at the point that we’re thinking about taking everything into our own hands naturally since the doctors don’t know why this is happening. My question to you would it be safe or wise for her to do a coffee enema, kliver flush followed by colonics. Your reply is greatly appreciated because were running out of time quickly!